A zero turn mower is a lawn mower that has it's mowing deck in front of the machine, rather than underneath like a traditional lawn tractor. The term zero-turn refers to the turning radius of the mower which is zero inches. A zero turn mower can literally turn on a dime. They are known for maneuverability and speed. A zero turn mower can be a riding mower or a walk-behind or stand-on mower. Most zero turn mowers are four-wheeled with two swiveling wheels out front and two large drive wheels in the back. Steering is controlled by operator handles which control each individual drive wheel. When one wheel is stopped and the other engaged, the turning radius of the machine is reduced to nothing. A zero turn mower can be better than a lawn tractor, it all depends on what it is used for. The advantages of zero turn mowers over lawn tractors are speed and maneuverability. The out-front nature of the mowing deck allows the mower to efficiently mow areas in a way a lawn tractor cannot, mainly getting into tight spaces and getting closer to obstacles. 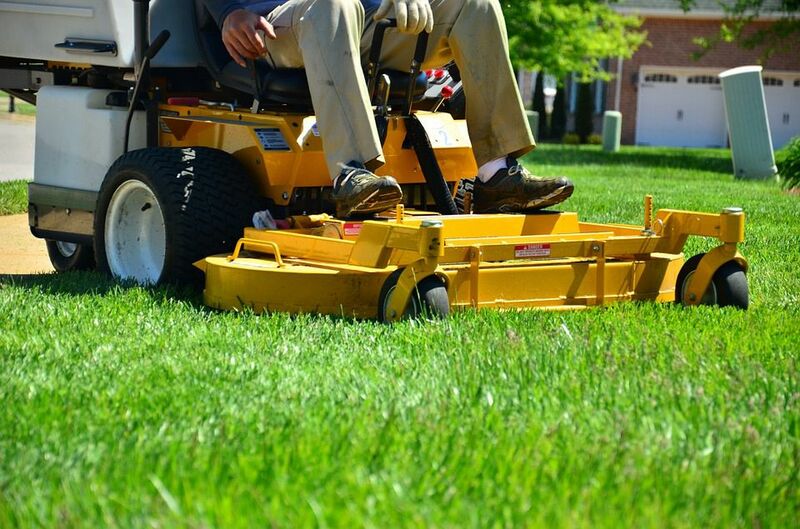 Zero turn mowers are also notoriously fast, capable of mowing acres of grass in mere minutes. Perfect for mowing sports fields or other wide open spaces in little time, but potentially dangerous in uneven, bumpy conditions. Zero turn mowers are most effective when operated by someone with adequate experience, and in some municipalities operator training is mandatory. While a zero turn mower can make short work of mowing a lawn, they do have some limitations. They do not operate well on wet turf as the tires tend to spin easier due to the nature of their steering. The individual wheel speed style of steering makes them prone to tearing up grass even when it's dry, especially when excessive speed is a factor. Zero turn mowers can also be dangerous on sloped areas and have the capacity to roll-over if operated on too much of an incline. More and more attachments are made available to zero turn mowers every year. The standard variety of collection systems and mulching kits are available and increasingly attachments like fertilizer spreaders, dethatchers, and even snowplows are becoming available. With the installation of a hitch behind the machine, any number of towable attachments can be used. Collection systems can range from side-mounted collection bins to rear-mounted collection bags while mulching systems include a modified mowing deck and specialized mulching blades. In addition to gas and diesel, more and more zero turn manufacturers are turning to alternative fuel sources. High fuel costs and a demand for greener energy have led to propane-powered options as well as electric. Many mower manufacturers offer propane or LP options and Hustler is one of the first to introduce an electric zero turn with their Zeon model but battery life and charge times still need to improve for mass appeal. The zero turn mower is a relative newcomer to the lawnmower scene. Although the out-front mower deck design goes back to the 1940s, the term "zero turn" and the modern zero turn radius mowers first came about in 1966 with the Hustler by Hustler Turf. Since then, every major mower manufacturer has entered the zero turn market with its own model. Initially, zero turn mowers were not quick to catch on. The idea was better than the technology of the time could permit. However, with the advent of cheaper and more efficient hydraulic motors, it eventually became more feasible to mass produces an efficient and productive mower. The list of zero turn mower manufacturers is extensive including Toro, Hustler, Husqvarna, Walker, John Deere among others. The speed and efficiency with which zero turn mowers work has guaranteed them a spot forever in the lawnmower market. They may not be for everybody, but anyone who wants to mow a large expanse of turf in as little time as possible could definitely benefit from a zero turn mower.